I’m planning on seeing The Great Gatsby this weekend, but regardless of whether the film is good or bad, I know one thing: its soundtrack is amazing. Seriously, listening to this on repeat got me through the last half of finals. So cringe-worthy: The 21 Most Awkward Moments in Handshake History. The Ryan Seacrest one is still one of the worst things I’ve ever seen. This video is very cute, but at the same time, every time I watch it, I’m super anxious and scared for the puppies. Is that normal? Puppies vs. Stairs: The Ultimate Supercut. Also, the pug hopping up the stairs at the end kills me. Is it too much for me to ask that this happens at Michigan’s Bell Tower? Game of Thrones Theme Played from University Bell Tower. Laughing at Ryan Lochte never gets old for me. 38 Maps You Never Knew You Needed. It’s true. Post-Oscar season, there had been a distinct shortage of awesome Jennifer Lawrence moments in my life. This week brought the remedy to that: Jennifer Lawrence Wins the Met Ball. 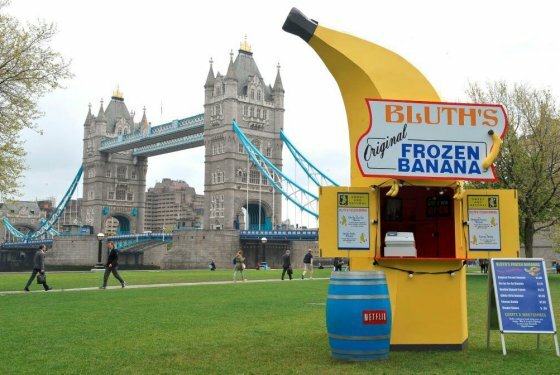 This week, in Arrested Development news: Bluth’s Banana Stand From Arrested Development Is Now Real and Maybe Headed Your Way. If this is in New York when I’m there, I’m clearly going. Politics aside, I find the Bush family oddly endearing. Exhibit A: love letters between George and Barbara. Things like this are why we all love the internet: Ryan Gosling Won’t Eat His Cereal.